I was working at North Star Cafe… The main baker there left... and I ended up buying a bunch of his in-home baking equipment… I started experimenting around in my house baking breads. Mainly just eating them myself, but I brought some to the farmers market and started selling them. People were like, “Oh, what is that? Who are you? What are you doing?” I thought it was cool. I’m making bread, making a few bucks here and there. I realized I liked doing it. One of the shopkeepers at the Clintonville farmers market let me set up next to their store. That was my start. The first day [that I set up at the farmers market] I sold out in 90 minutes. The bread definitely wasn’t as nice as it is now but it was cool how much demand there was for a product like this. I’m not professionally trained in any way. [North Star] was its own type of baking. So any of the bread making training that I’ve gotten has been self taught. I’m growing with the recipes, just working with them. Trying and failing many times. All of this time and money spent. Right... I grew the business slow and methodical. I didn’t really change the processes a lot. I have a really small staff, it’s very personal. It’s very much a passion that we all have. It’s not some large corporate production. Yes, we make a lot of bread, but we try to have that handmade feel, bring the love to the dough. I mean whatever but it is true. It’s something I never really want to grow so much that it loses that feel. Because then what’s the point? That is why I work in the first place. That is why I’m happy with it in the first place. So many people want to grow so fast, you lose that initial excitement and then it’s just another corporation. Do you still wake up excited about coming to work? Oh yea! I love it! So I went to San Francisco for the first time last week. That was just a mind-blowing experience. I’ve always followed Tartine Bakery and Josey Baker and Don Guerra in Tucson. So I finally got to make a trip out there. It was so inspiring to see all of these bakeries and compare your bread vs theirs. To have that experience, [I came back] more excited to work with the product. To bake what I know. We do a really good job, I felt like ours held up. We’re making an awesome product and we don’t need to change much. What is an unexpected favorite thing about running your own business? …I guess finding people that are as passionate as you about it. That really has been awesome. [It’s also] something I’ve had to come to terms with, because I’ve not wanted to give up the responsibility of dough shaping, mixing, baking, all that… To grow the business and to have free time, I’ve had to [let go of some responsibility.] It’s been fun finding people that are as passionate about the product and the business and the whole philosophy as I am. I’m a pretty introverted person in general. So bringing in other people has been something outside of my comfort zone, but it’s been one of the best things. Creating your own bread community. Yes. Watching that bread culture grow, and I don’t mean the sourdough culture. I mean the community around the city that appreciates this bread… Watching that grow and materialize over the last six years has been super sweet. It makes you feel a lot more grounded. More responsible and influential in a way too. You can really affect change in a pretty cool way. By making a product that people can’t find elsewhere and can really get behind. That’s one of the things I picked up from baker Don Guerra in Tucson. His community out-reach philosophy… Instead of just making a really great loaf of bread, really connecting to the community. Teaching people ... how it is different from something they would buy at the grocery store. It made me really appreciate that and want to do something like that in Columbus. Bringing the bakery back down to the community level. Like they used to be. Right. It has become this celebrity thing, and I don’t feel like that’s necessarily how it going to ride out. It’s awesome that it has that sort of exposure right now, the local foods and ‘back to the old methods’ foods. I think in the longer term it is more going to be more intimate than that, less flash. But you know, it’s always going to change. What gave you the idea for the Toast Bar? 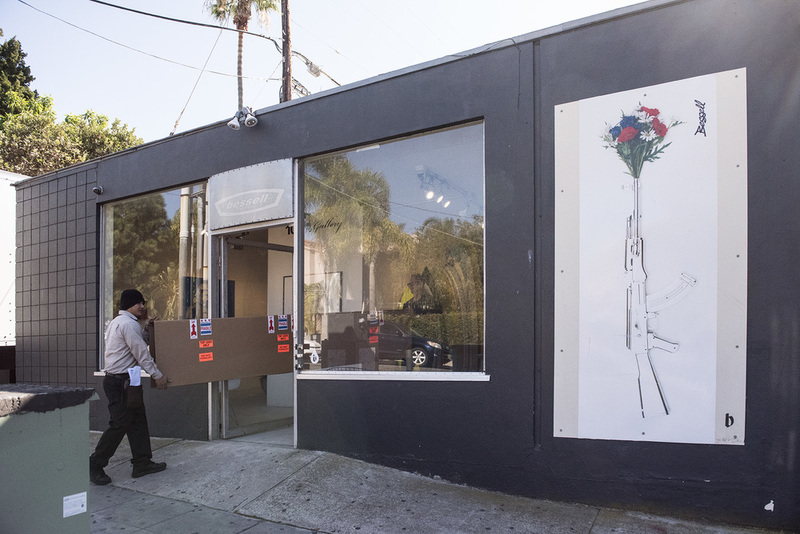 In San Francisco, Josey Baker has a shop called The Mill. They took the artisan toast trend of San Francisco [started by Trouble Coffee] and opened their own. I went to Intellensia Coffee in Chicago and they were doing a flight sort of deal as well. and I thought, “Man that’s a perfect idea!” People can get exposed to the bread and in a non-pretentious way. It’s really funny, because as soon as I launched the idea, people were like, “That’s so pretentious.” That’s exactly what I was not going for. People can feel how they will about it and come see it if they like. It’s just a way to try the different breads and grains and spreads and such without committing to a whole loaf! And it allows us to make our own butter, jams, almond butter, [etc]. To have an excuse to expand into more things! Right. I’ve tried to expand things too much before. I get really crazy ideas and try to do too much. Business is better when it’s focused and streamlined. I’ve had to realize, with these crazy expansion ideas, what we’re the best at. Keep it limited, keep it focused. Until we’re really, really ready to grow past where we are… Knowledge is half the battle. To know that, to see how to adapt. The options are limitless. You have to calm down about trying to do everything. Absolutely. Just because you can, doesn’t mean you should. How long have you lived in La Jolla? I was born in Wichita, Kansas. My family moved down here when I was two years old. I’ve been here ever since. Right up the street. I like to joke my umbilical cord isn’t very long. 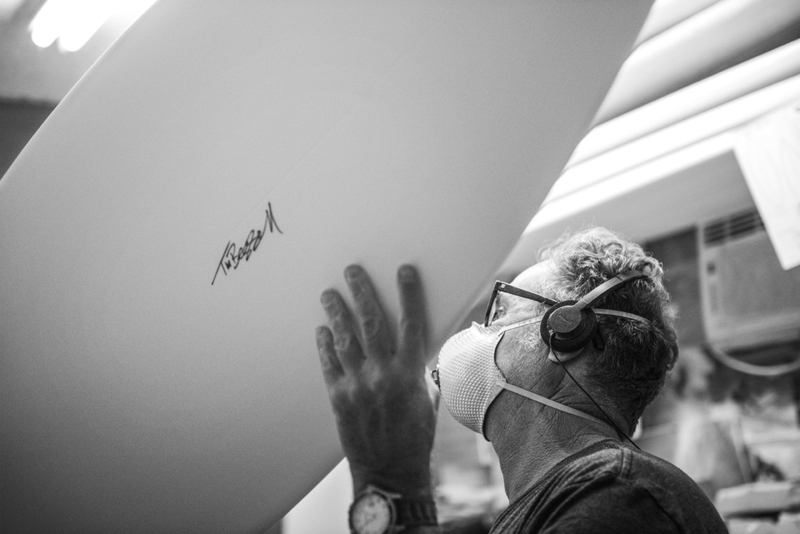 How did you get in to making surfboards? On my 13th birthday, my brother and my best friend gave me a stripped down long board. They had all these old beat up surf boards that they stripped down, took off all the fiberglass. That was it. I made that board and it came out pretty decent. So my neighbor gave me a board that had turned out really bad. I stripped it down, took off the fiberglass and shaped another one. I sold that one. I was in high school, only 13 or 14, when I started. It’s hard to turn down work when people are paying you! It takes you about an hour to shape a surfboard? Well, it depends. This model, I have it down. I can do it really easily and fast, but a longboard takes maybe two or three hours. It all depends. Whether the foam is cooperating that day. Most surfboards are made off machines. I still like to do it the hand-crafted way. Does it make any difference in performance? Do people notice a difference board to board? Hand making them must allow you to make them in more sizes. I can make anything any size, any shape. Where do you get your foam? It is already in a rough surfboard shape. They have molds. They start with a liquid foam and they pour it into a mold. 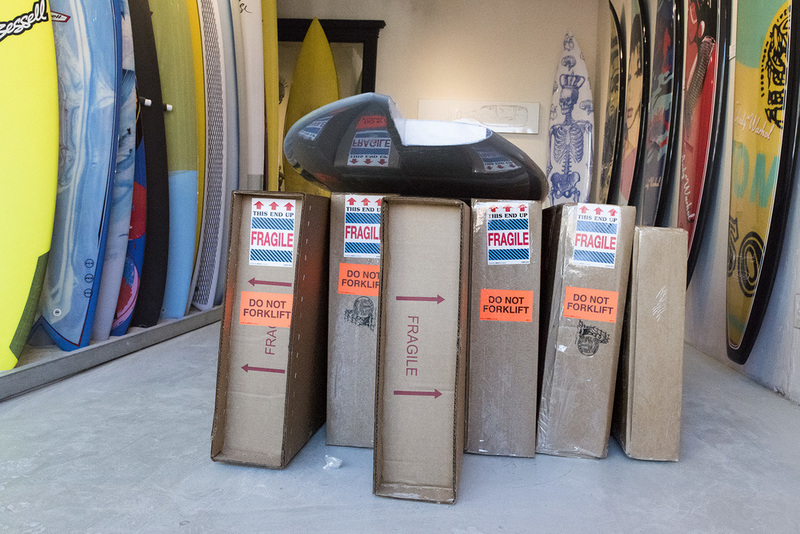 There’s probably hundreds of different molds for different styles [and sizes] of surfboards. After a foam board core is shaped, what are the rest of the steps of making a surfboard? So there’s this fiberglass cloth, it’s like any kind of cloth made out of fiberglass, you lay that, you dress, the bottom of the board. You cut the fiberglass and wrap it around. Then you take this resin, which starts off as a liquid and turns into a solid with a catalyst. You squeegee that on. Then you flip the board over and repeat the lamination on the top side. Lamination resin never really dries. It always stays tacky. That’s so it won’t de-laminate from the board. After the whole board is laminated, you take a different kind of resin, which has surfacing agent in it, and paint that over the bottom [of the board]. Sand that down and that’s your basic high performance surfboard. If you want something with art [on the top face of the surfboard], you have to laminate that into the board. That has a third layer of resin, called a gloss coat. You polish that out like a car, that’s how you get it so shiny. Most of the high performance shortboards are just sanded finish. They’re light. You could actually use the art boards? They are meant to be used? Yea! My idea was to put my best work with Andy’s artwork…With the Warhol boards, those had to be approved by the Andy Warhol Foundation. What gave you the idea to put Andy Warhol’s art on surfboards? Ok, I’ll tell you how it happened. So my friend and protege, Ben Blank, he told me about this website Fab. Have you seen Fab? This was three years ago, so Fab was a little different than what it is now. He was going, “Tim, you need to put your surfboard on Fab.” And I’m going, “I just don’t see it.” Well one day I saw Warhol skateboards. I thought, “Ooooh, that’s it! I could be the surfboard guy. They’re giving licenses to skateboard guys, I’ll see if they’ll give me licenses.” And they did. Now we’re in our third year [using Warhol’s art]. When did you start making your own art? I don’t know. I just like making stuff. As long as it involves your hands. When was your last show? August, in New York. We sold out. We’ll be in New York again next summer. What influences your personal art? [Some people who influence me] are Andy Warhol, Duchamp, Picasso. How often do you surf? I try to surf everyday. Any quick advice for first time surfers? Start on a longboard and work your way down. Allison Chapman owns and runs Igloo Letterpress; a small letterpress, design, and book binding business. How did you get your start in letterpress? “My grandfather was a hobby printer. I learned by hanging around the studio with him. He was really interested in machinery and how things worked. The things I like about [running] Igloo are process and problem solving. That’s the creative part that I get energy from and get excited about. "The green press was my grandfather's." A plastic plate ready to print. I’ve had quite a few people ask me what the difference is between letterpress and computer printing. Do you work much with antique plates? When are you hoping to move into your new space? Were you surprised/impressed by the response to your Kickstarter? Many of the cards Igloo Letterpress prints and sells are collaborations with local artists. The Snow House is the gift shop for Igloo Letterpress. They also carry goods from local artists. How has Igloo grown over the years from a hobby to a full time business with employees? “Our family moved here from Minnesota in 2008. At the time I was pregnant. Igloo in Minnesota was me, in the house. I had a job at the time where I taught letterpress printing [in a different shop]. I didn’t know anybody [in Columbus]. It was my way of building something for myself here and meeting people that cared about the same things I did. Aaron Scamihorn is an art director by day, and silk screen printer/graphic designer/illustrator by night. AJ, his wife, works along-side him and is ‘quality control manager.' Together they are RONLEWHORN INDUSTRIES. Do you print mostly your own designs? Do you screen print others’ designs? What do you do AJ? Do you usually do pretty well at craft shows? “Some years all I’ve had are giant posters, I don’t do so well. When I have more art prints and smaller stuff [giving] people options, everything sells better. The bigger stuff sells well when they have the option of the smaller stuff. They look at the smaller stuff [but then decide to buy] the larger print! How did you get started screen printing? “I grew up playing in bands. I really love music and [wanted to stay connected to] music…Growing up, my parents were potters and my dad was an art teacher. Everything we did growing up was very hands on. [I work in] a cubicle and the digital design world. The one thing that was missing from the process for me was creating something with my hands. I started doing a lot of show flyers, and [I was] looking at a lot of gig posters. I began to have this desire to figure out [how to screen print.] With the help of YouTube and some buddies who had a t-shirt printing business…I began trying to figure it out. There was a lot of trial and error. When you are working on a new design, do you hand draw or design it on the computer? “It depends. This design [that I’m printing now] was 100% digital. I’m working on a piece right now for Gallery 1988 out in LA. They do pop culture shows. [The show coming up] is a tribute to Tom Hanks. (June 13-20, Los Angeles) My piece is [inspired by] the film The ‘Burbs. It was all hand done. I used a light box, photo references, tracing paper… And then scan it into the computer for layout. I do a lot of my typography by hand. The DropKick Murphy’s gig poster was all digital, but I did the type by hand. That’s interesting how language is a larger draw than pictures. This is (right)Rod Landess, owner, and (left)Shawn Davis, head brewer, of the New Boswell Brewing Company. How did you start New Boswell’s? Rod: "Basically I wanted to start a business. My senior year in college I had to do a project for a business class I was taking. I did a business plan for a brewery. [At the time] I was home brewing with my friends…up at Ball State. That’s where this idea for a brewery [came from.]" Where did the name New Boswell come from? "There was one physical description we found of him. He had one eye. So everyone in our pictures has an eye-patch. [Points to posters and t-shirts hanging on the wall. The drawn characters all sport an eye-patch.]" Shawn, how did you get started brewing beer? Shawn: “I got started brewing as a hobby. My friend and I started making home brew beer in his garage. [Starting out] it was all extract brewing. Which is basically a bunch of sugars. We just kept advancing our equipment and moving up. We moved [up from extracts] to what’s called a partial mash. It still uses some extracts, but going towards more grain… As we put more money into it, we went to all grain brewing. Which is what all the brewing is here [at New Boswell]. “From there, we joined a home brew group that meets here [at New Boswell] every month. Started talking to other people that are home brewing. It’s such a wonderful pish-posh of people. We’ve got people who are chemists, professors, and the laymen, like me. Everyone has their own style and [different ways] of breaking down brewing. Some people break down the whole thing in a scientific way. For them it’s really neat, the chemistry and the biology of it. What’s the best non-traditional or craziest beer you’ve come up with? Shawn: “I took a recipe that Rod had. We were trying to make a Christmastime beer. He was focusing more on a gingersnap cookie taste. For me that wasn’t really a traditional wintertime/Christmas taste. In the wintertime our bodies know that we’re supposed to bulk up and [we seek out heavier foods and beverages.] Things that make us feel warm and comfortable. With this [Christmas] beer, all I kept thinking about was my late grandmother’s gingerbread. The nice dark, thick, and gingery bread, but also the nutmeg, mace, and bit of clove. I ended up re-doing his recipe. So many people said to me, “Man, that tastes just like cake.” It was boozy, malty, and a lot of flavor in it. above: "Grains. Different styles of grains from different regions… You get different maltiness-es, sweetnesses and flavors when you use different types of grain." right: "We’ll throw together our grain blend, then mill them in our homemade hopper... We’re milling that down to a consistency like chicken feed." You can see part of the homemade hopper behind Shawn. left: "A brewer never makes beer. He just makes really good wort. Wort is what beer is called before it’s been brewed. Yeast makes beer...This is where all the chemistry plays into it." Shawn: “When I joined up with Rod a year ago…I started volunteering with him. He’s always liked the beers that I’ve made as a home brewer. I would bring them in [to the home brew meet-up group] and everybody would like them. Part of what we do in this beer club is bring in our beers and everybody tries them. [We] critique one another’s beers. I was volunteering for him and he asked me if I would mind working three days out of the week. Eventually, he asked me if I would like to come on full time. I get paid to do a hobby, I don’t work. I haven’t worked for over a year. It’s great! Special thanks to Scott Alexander for all your help! A pendant and an in-process pendant. This is Hannah Hoffman. She is a jewelry designer. Soon after graduation, she took a jewelry class at the Columbus Cultural Arts Center. How often are you creating new pieces? “I feel like, often. I do a lot of production work. You have to do a lot of production work to make any money. But I’m always trying to experiment. I usually end up experimenting with my mistakes. I’ll heat something too hot, or melt something, or bend a wire in a way I can’t bend it back. That’s how a lot of new pieces happen. I also sketch and create things in that way. Pierre the cat has little interest in jewelry making. What has been your favorite part of having your own business? “I like the independence. I like being able to choose how I spend my day… I can take a break in the middle of the day and go to the gym or yoga. “I never expected to run my own business. I’m still surprised that I do it. People will say, ‘Oh, this is Hannah, she runs her own business.’ And I think Me? Oh yeah! I forget! Sometimes I feel like I’m just playing around. It’s fun to look back and see how my work has progressed. And get feedback. Some people have been interested in what I’ve been doing the whole time. So that feels good. And I get to do something that requires fire. That’s a huge bonus." Ted is holding a newly resoled loafer. Shoe sole sewing machine. Stacks of soles on shelves above. Nailing machine on left. Grinder/sander/buffer on right. Shop front on Main Street, Richmond, Indiana. Ted shined all of the shoes on the shelves behind him while I was there. There are shoes everywhere. George Marinakes is a second generation shoe repair man. His son, Ted, works part-time in the busy shop. Ted has a full-time job but helps his dad out in the evenings and on Saturdays. Both father and son are quick to laughter and very helpful. During my two hours in the shop, every customer left with a smile on their face. In the 1930’s and 40’s, the shop was open on Sundays. People would stop in before church to get their shoes shined. This bench used to be twice the size and seat 6. The shop used to employ two shoe shine boys. Now, customers drop off their shoes to be shined. Has business been affected by mass produced and cheaper shoes? George later introduces me to the only glue that works on molded soles. He was re-glueing the sole of a sneaker. The glue is from Germany and very expensive. He kept asking me if I could smell it. It is very strong. His doctor has told him to stop using it: George has asthma. George’s doctor has also told him to retire. So if you’re not satisfied with your work, if your work didn’t come out like you wanted, the customer will know it and will not be satisfied with your work, either. So as long as you’re pleased with it and your work looks good … then you know you’ve accomplished something and that works out to please both parties. That’s the main thing. Anything that you do. Your work or anybody else’s. If you look at it and say ‘Well I’ve accomplished something here, it’s amazing and something I appreciate,’ [then] the customer will appreciate it also. That’s what brings them back. You seem to have plenty of work!